Stocks are lower this morning on overseas weakness. Bonds and MBS are up. Slow news day. China has given up on using state funds to support its stock market. The government has spent about $200 billion trying to support the stock market. The highlight of the week will be the jobs report on Friday. This will be the last jobs report ahead of the September FOMC meeting. After last week’s market sell-off, the Fed Fund futures contracts took their assessment of a Sep hike from around 50% to about 30%. Aside from the jobs report, we have some important economic data this week with the ISM surveys and construction spending. That said, the jobs report will be the big event. The ISM Milwaukee Index came in at 47.67, a bit lower than expectations. The Chicago Purchasing Manager’s index was almost flat at 54.4. Stanley Fischer made some hawkish comments in Jackson Hole on Friday, which is what stopped the rally in stocks. I had a long interview with Louis Amaya on his Capital Markets Today show. You can access it here. I discuss the economy, real estate, the Fed and China. The interview starts at the 3 minute mark. Stocks are taking a breather after a big two-day rally. Bonds and MBS are up. Personal Income rose 0.4% in July, in line with expectations. Personal Spending rose 0.3%. The Core PCE Index (The Fed’s preferred measure of inflation) rose at 1.2% YOY. Nice to see a little wage inflation. On the other hand, the low PCE inflation is going to worry the Fed. Note that the National Labor Relations Board just issued a pro-union decision to make a company that hires a temporary agency for workers a joint employer. This will supposedly make it easier for workers to unionize and it makes the ultimate employer liable for what happens to temps. This was considered a big win for the unions. Does it ultimately result in higher wages, or simply more campaign cash for Democrats? I am betting on the latter. St. Louis Fed Head James Bullard says that the recent volatility in the markets isn’t going to be much of a factor in the FOMC’s decision-making next month. The Fed Funds futures however discounted the probability of a Sep rate hike from about 50% to about 30%. Pending Home Sales rose 0.5% in July. The real estate market is inching better, but tight supply and affordability issues are holding things back a little. Consumer sentiment fell in August, according to the University of Michigan. The 91.9 reading came in below expectations. Markets are higher this morning as yesterday’s rally held and was followed throughout the world. Bonds and MBS are down. Second quarter GDP was revised upward to 3.7%, a strong reading. Consumption rose 3.1%, and the core personal consumption expenditure inflation index rose 1.8%. After seeing these numbers, it is easy to see why the Fed was looking to hike rates in September. That was before the global financial market sell-off. The September jobs report next week will be huge. Initial Jobless Claims fell slightly to 271k, as we sit at more or less record lows. The Bloomberg Consumer Comfort Index rose to 42 from 41.1 last week. Roughly 1/3 feel positive about the economy, while 54% feel positive about their personal finances. The sell-off in stocks has been dramatic – in fact the last time we saw this big of a downward move over several days was 1940. The more interesting market has been bonds, which have barely benefited from the big drop downward, and gave up all of those gains almost immediately. The US dollar has been getting whacked during this sell-off as well, which means foreign money is dumping Treasuries. It probably is the petro-economy states doing it, however I have been hearing rumblings of Chinese selling. Whether this is a new dynamic in the market or not remains to be seen, however the action in the 10-year feels like the path of least resistance is now down in price / up in yield. The Washington Post has another article talking about how stocks are “rigged” based on trading on Monday. Yes, stocks were all over the place, however the structure of the market has fundamentally changed as a result of technology and regulation. There used to be professional market makers for NASDAQ stocks and the specialist on the floor of the NYSE that would be the buyer when everyone else is selling. On days like Monday, they would lose money, but make up for it in normal trading, by selling a stock 1/8 or 1/16 above where they were willing to buy it. Nowadays, with sub-penny spreads, the market maker will never make back losses on days like Monday, so they no longer do it. The only ones left are the high frequency traders, who may or may not be liquidity providers. Stocks aren’t “rigged” – investors are getting what they pay for. Ray Dalio (of Bridgewater) explains why the Fed may hike rates a quarter of a point or so before launching QE4. His point is that there are two cycles to pay attention to: the first, which is the shorter term cyclical economy that lasts a decade or so versus the long-term cycle, which lasts closer to a century. He is making the argument that the Fed is probably going to do another big easing before the big tightening. This tightening might be 25 or 50 basis points, which he doesn’t consider a major tightening. The Fed is focused on the classic recession – expansion phase which began in 2005 and is more or less where we are today. Dalio believes we are at the end of a debt supercycle, and the last time we went through a debt supercycle deleveraging period was in the 1930s. And while US corporations (and households to a large extent) have gone through a major deleveraging, the rest of the world has not – especially China, which is just entering their deleveraging phase. Interestingly, these supercycles are not new – even the Bible refers to them as 50 year cycles followed by a massive forgiveness (called jubilees, even though they aren’t all that much fun). Green on the screen again this morning as stocks try to rebound. Yesterday, stocks traded up early only to give it all back late in the day and close with big losses. Bonds and MBS are falling again. Durable Goods orders were strong at 2%, and June’s number was revised upward. Capital Goods Orders Non-defense, ex-air (a proxy for business capital investment) rose 2.2% versus a 0.3% expectation, while June was revised upward from 0.9% to 1.4%. These were the highest readings in a year. Mortgage Applications rose 0.2% last week as purchases rose 1,7% and refis fell 1%. Surprising that refis fell given the 17 basis point drop in the 10 year, but it looked like TBAs (which set mortgage rates) largely ignored the move in the bond market. Not sure what caused yesterday’s late day sell-off, but the S&P 500 made a 60 point swoon in the last hour of trading to close down 26 points. The other interesting thing about this sell-off has been the fact that bonds have not reacted much to the sell-off. The flight to safety trade has been almost non-existent in Treasuries. Odd, since the sell-off has taken down the probability of a rate hike in September. In fact, many strategists are moving out their estimate for the first hike to 2016. Larry Summers was arguing over the weekend that financial conditions are acting like a tightening, and therefore the Fed doesn’t really need to raise rates right now. Hotlanta Fed President Dennis Lockhart said that conditions in the financial markets have complicated the Fed’s decision. By any measure, inflation is nowhere to be found. Given the fear of replicating the 1937 mistake, the Fed is probably going to err on the side of caution. Aside from the psychological discomfort of having rates at 0%, what reason is there to raise rates? The carnage in the stock markets in Asia have created some bargains. HTC (the cellphone maker) is trading at a discount to cash. Market cap of $39.7B, no debt, $47.2 billion of cash. Like buying dollar bills for 84 cents. In crisis, opportunity. Markets are higher this morning after the People’s Bank of China cut interest rates and required reserves. Bonds and MBS are down. The Chinese Government is going back to the big levers to try and support asset prices – using rate cuts and reserve requirement cuts. They are also using pension fund money to buy stocks and have prohibited insiders and large investors from selling. John Hilsenrath from the Wall Street Journal described China this way: China is like a CDO. You don’t know what’s inside, how well it performs or where the leverage is until it’s under stress. I think that is a very apt description. The FHFA House Price Index rose 0.2% in June, lower than expectations. The S&P Case-Shiller index of real estate prices fell 0.12% in June but is up 5% year-over-year. New Home sales rose to an annualized pace of 507k in July, slightly lower than expectations. Surprisingly, consumer confidence rose in a big way to 101.5 from 91. McMansion builder Toll Brothers reported numbers this morning which missed analyst estimates. Revenues and deliveries both declined. Average selling prices actually declined – first time we have seen that out of the builders. That said, signed contracts were up 30% in dollars and 12% in units as ASPs rise to $834k from $717k last year at this time. The stock is up half a buck pre-open, but then again pretty much everything is green this morning. During the big sell-off in the markets, Treasuries only moved grudgingly higher. I had been reading that the Middle East (which is getting crushed by low oil prices) was selling the 10 year in a big way. Interestingly, TBAs and mortgage rates have been fading the move in the bond markets. People have been moving back their timing estimates for the first rate hike and bonds are not reacting much to it. For those that are market history buffs, here is a cool chart showing the economy from the American Revolution through WWII. Morning Report: Shades of 1937? The #1 trending topic on Twitter is #BlackMonday. 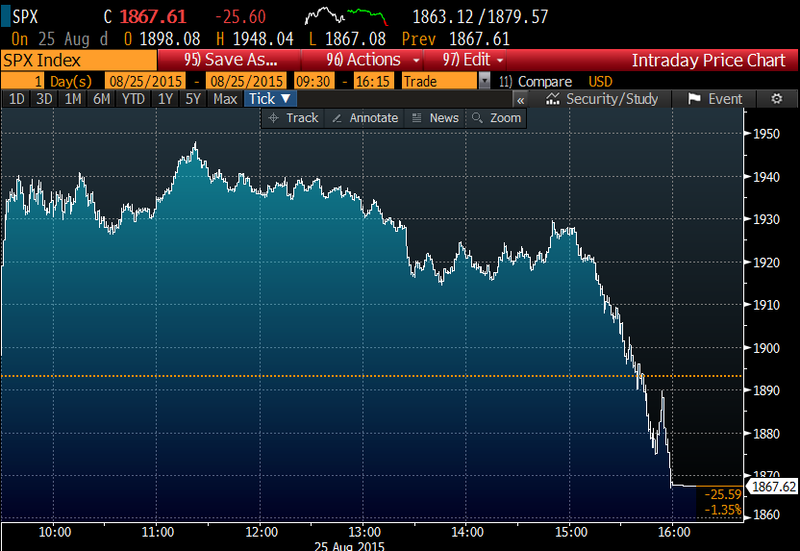 The global stock market sell-off continues this morning, with S&P futures down 64 handles. Bonds and MBS are up small. Markets sold off hard overnight, with Japan down 4.6%, China down 8.5%, and Europe generally down 4.5%. Commodities are getting clocked, with oil down to $39 a barrel. Emerging markets are getting crushed. The Chicago Fed National Activity Index rebounded from -0.07 in June to 0.34 in July. The sell-off in risky assets over the past week has pushed out the market’s forecast for the first rate hike out of the Fed. Futures are pricing in a first hike in the Dec – March timeframe. Over the weekend, Larry Summers penned an editorial in the Financial Times encouraging the Fed to stand pat for a while. He makes the point that the sell-off in assets has a tightening effect all by itself, and hiking rates in this disinflationary environment risks another 1937. After stocks bottomed in 1932, the Dow Jones Industrial Average went on a tear, increasing almost fivefold in 5 years. 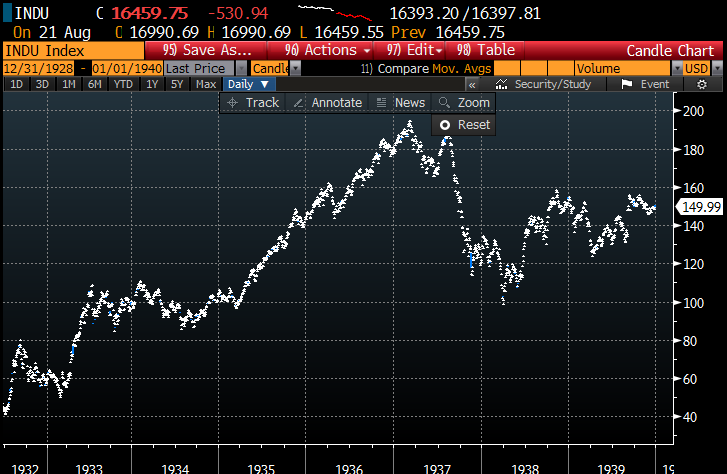 In 1937, however they started a brutal 1 year bear market, where stocks got cut in half. The most common explanation for the sell-off was the Fed’s tightening in late 1936 and early 1937. Now, there are a lot of reasons for the sell-off in the 1930s (markets sensing something afoot in Europe, FDR’s undistributed profits tax, etc), but the Fed is very cognizant of their role in the “recession in the depression” and this will certainly guide their decision-making. With stocks hitting air pockets on the downside, you would expect to see Treasuries flying. Yes, they are up, but not by as much as you would expect. Supposedly there has been massive supply of Treasuries coming out of the Middle East, which is keeping a lid on prices. Stocks are lower this morning again after yesterday’s bloodbath. Bonds and MBS are up small. Some people think the bond market’s strength is telling the Fed not to hike rates. I agree that bonds are pricing in the view that inflation is never, ever, ever going to come back. However, the US interest rate market is so manipulated by central banks (indeed all bond markets are these days) that I don’t think bond prices are the reliable signal they typically are. Foreclosure inventory is down 24% year over year, according to Black Knight Financial Services. The delinquency rate has fallen to 2.2%, pretty much a post-crisis low. Is the rust belt making a comeback? House prices are rising again in the Midwest as the auto industry recovers and the place becomes simply too cheap for business to ignore. Of course parts of the Midwest were ground zero for CRA lending, especially places like Detroit, which is filled with abandoned homes worth $10,000 with $100,000 mortgages on them. If you want to see what economic collapse looks like, check out this video of Toledo Ohio, my hometown. Most of these houses are worthless, and this is why I have always thought the fears of the big foreclosure inventory were overblown. These houses may count for the foreclosure numbers, but they certainly are not competing with anything and are probably never going to sell.